Chicago, a whirring city with 2.7 million residents, has 77 neighborhoods—from Albany Park to Woodlawn—and it’s the third largest in America, following New York City and Los Angeles. The metropolitan area, referred to as “Chicagoland”, is home to 10 million people. As the international nucleus for many industries—technology, finance, telecommunications, transportation, and commerce—as well as the home to one of the busiest airports in the world—O’Hare International Airport—this city can present some challenges getting from point A to point B. Use this guide to navigate Chicago, positioned along Lake Michigan, and avoid the occasional driving snafu that so many visitors experience. 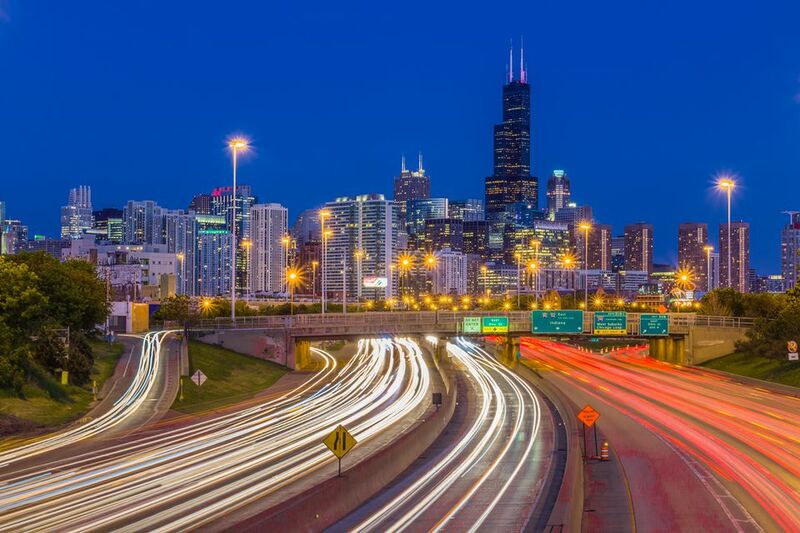 A number of rules exist, and are enforced by law, when driving in Chicago, specifically with regard to safety, construction zones, and lane usage. Cell phones: While hands-free devices and Bluetooth technology are allowed for drivers over 19, handheld cellphones and headsets that block both ears are prohibited for obvious safety reasons. Construction zones: When entering a work zone, motorists are required to change lanes where possible, yield to workers and authorized drivers, and reduce speed. Emergency vehicles: Slow down and proceed with caution when an emergency vehicle is parked on the side of the road. Cellphones, and photographs, are prohibited within 500 feet of an emergency scene. When an emergency vehicle is moving, and you can hear or see it, pull to the right side of the road or stop vehicle to allow it to pass. Right of way and passing: Yield to pedestrians in a crosswalk and school children during school hours. Do not pass within 100 feet of an intersection or railway crossing, a school or work zone, or when your view is blocked. Alcohol: The number one killer on Chicago highways is alcohol and there are digital signs on the highway to alert you to the number of deaths, which increase as time passes. Blood-alcohol concentration must be lower than .08 and if it’s higher, you’ll be hit with a Violent Crime charge. Expressway driving: When entering the highway, there will be a speed-change lane to increase speed before merging. The right lane is for slower traffic while the far-left lane is for faster cars. Note: freeway exists may be on the left or right side. Winter conditions: Snow, ice and darker skies are all conditions to contend with on Chicago roads—increase following distance, slow speed, drive with windows fully defrosted and cleared of snow and ice, and make sure you have nonfreezing window washer fluid. Also, break early and use slow and steady pumping to avoid skidding. Aggressive driving: It’s worth noting that aggressive drivers—speeding, passing on the shoulder, cutting off another driver, slamming on the breaks in front of a tailgater, honking, yelling, etc.—are present on the road, which may pose a risk. Do not engage the aggressor, leave space for passing and lock doors with the windows rolled up. Always check traffic reports in real time before driving in Chicago, especially if you have quite a distance to travel. Timing can vary drastically depending on when you are on the road. Within the city, the streets are positioned in a grid, running north to south and east to west, which makes navigating fairly easy. The expressway, however, has expected traffic jams daily. What time is traffic the worst: Illinois Department of Transportation cites that, on average, traffic is the thickest between 6 a.m. and 8 a.m. and again peaking between 4 p.m. and 6 p.m. on interstate highways, with afternoon traffic on Thursdays and Fridays being the heaviest. Bottlenecks and a high number of cars on the road are both factors. Traffic accidents, inclement weather, and construction also play a part. Seasonal traffic: Summer is the worst season for traffic, due to construction, increased tourism and end-of-year school and work schedules. I-55, the Stevenson, experiences the largest increase in congestion, followed by I-290, the Eisenhower, and I-90 and I-94, the Kennedy and the Edens. Reverse commute: Drivers commute on Illinois expressways into the city, from the suburbs, and the reverse is also true. The commute time is still heavy during peak hours, however, on the Edens expressway (I-94), northbound traffic is higher in the morning and southbound is higher in the evening. Sporting events, festivals and concerts: Keep in mind that big events, concerts and games all increase traffic. If there is a Chicago Cubs game or concert at Wrigley Field, for example, you can expect high traffic and limited parking throughout the neighborhood (plus, full public transportation). Several parking options—massive garages, tiny lots, and street parking—exist in Chicago, with fluctuating prices dependent on where you’re going and for how long. Here are some types of parking you can expect to see while in the city. Parking garages: Grant Park North, Millennium Park, Grand Park South and Millennium Lakeside garages are convenient for accessing the city between the Chicago River and the lakefront. Discount are available if you purchase your parking vouchers online, in advance, and also if you purchase a multi-day pass. Rates vary depending on how long you’ll be parked—1, 3, 8 or 24 hours. Early bird rates between 5 a.m. and 9, for example, are $16. Reservation services: Using a parking app or an online reservation service to purchase a spot ahead of time is a good idea to guarantee you’ll find a space near where you need to be—plus it will be offered at a discounted rate. Multi-day and monthly parking is also available through these systems. You can guarantee that you’ll have a space for your car in garages, lots, and spaces throughout the city. Museum parking: Chicago museums have parking lots nearby. The museum campus—Shedd Aquarium, Adler Planetarium, Museum of Science and Industry, Field Museum— Soldier Field, and the Lakefront Pavilion at Northerly Island, serves up surface parking at the Planetarium Lot, East Museum Lot, and South Lot, and underground parking at North Garage. Valet: If you don’t mind spending a bit more cash, valet parking is a great option for hotel guests, restaurant goers, and theatre enthusiasts. Plus, with Chicago weather often making sidewalks a challenge to traverse, you’ll keep your shoes clean and dry. Meter parking: Prices vary by neighborhood, block by block, and nearly all meters accept credit cards only. You can usually use an app on your cellphone to pay as well. Many neighborhoods have limited parking, with street parking allotted for private residents only. Often, you’ll find yourself circling the block, looking for a spot to open up. Make sure you carefully read all of the parking signs, with restrictions listed, and look out for “No Parking” paper signs tied to trees and posts due to regular street cleaning to avoid your car being towed. Should You Rent a Car in Chicago? Renting a car certainly gives you flexibility and access to transportation exactly when you need it, however, it’s not necessary. Operated by the Chicago Transit Authority (CTA), the Chicago “L”, short for elevated, is the easiest, and often fastest, way to get around the city. Running over 224 miles of track, travelers can ride the Red, Blue, Brown, Green, Orange, Purple, Pink or Yellow lines to get pretty much anywhere in the city. The Brown, Green, Orange, Pink and Purple Line Express trains all travel to the Loop in downtown Chicago. Of course, there are busses, taxis and bicycle rentals as well throughout the city. To blend in and not cause any ruffles while driving in Chicago, follow these tips. Yield for pedestrians. With nearly three million people living, working, and going to school in Chicago, there are many people walking on the street; through busy intersections; and along the curbs, hailing a taxi or rideshare. Keep a look out and be safe. Drive with intention. When exiting or entering the freeway, be assertive and proactive. You’ll have to flick on your blinker, increase your speed, and tip your car nose into the traffic to keep up with the fast-paced flow. Also, use all three of your mirrors to keep an eye on approaching Wiley E. Coyote drivers. Watch out for cyclists. Drivers have to share the road and often, without you even noticing, cyclists (motor or pedal) will be weaving in and out of cars, passing along the center line and sneaking up on the shoulder—be vigilant. Use your blinker. Using your blinker seems to be an obvious suggestion, but it’s really important when you’re driving with lots of cars, bikes, and pedestrians on the road. Also, just because you have your blinker on, doesn’t mean another car will let you in—you may have to be more aggressive than you’re accustomed to while driving in Chicago. Honk nicely, if at all. Unless a long and loud horn honking is explicitly necessary, offer a quick and light “beep beep” to get your point across when necessary. City buses: Watch out for public transportation exiting and entering the lane to pick up and drop off passengers. Many of these buses are accordion style—super long and big—and they take up a lot of space as they’re moving around. Change lanes when possible to avoid being stuck behind one of these behemoths. Cameras: Many red lights and speed devices have cameras that will ticket you if you disobey traffic laws. Tolls: Prepare to pay a toll, between 55 cents and 3 dollars, while driving on Illinois highways. If you don’t have change or money on hand, you can pay within seven days online. You’ll have to take note of the toll plaza or mile marker number to identify what amount you owe and where you were when you missed the toll. Payments can also be made by mail, but this is not a recommended method as it will need to be received within the seven-day requirement.